For years, 38-year-old Portia Nathan has avoided the past, hiding behind her busy (and sometimes punishing) career as a Princeton University admissions officer and her dependable domestic life. Her reluctance to confront the truth is suddenly overwhelmed by the resurfacing of a life-altering decision, and Portia is faced with an extraordinary test. Just as thousands of the nation’s brightest students await her decision regarding their academic admission, so too must Portia decide whether to make her own ultimate admission. 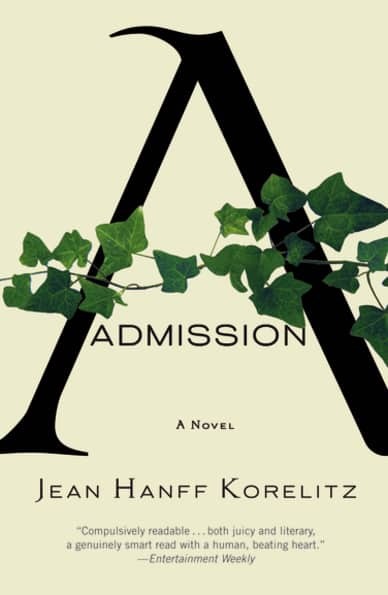 Admission is at once a fascinating look at the complex college admissions process and an emotional examination of what happens when the secrets of the past return and shake a woman’s life to its core. Portia is in her late thirties, and her career as an admissions officer at Princeton University takes up much of her time and energy. The university gets stronger applicants every year, and it’s all Portia can do to keep up with the grueling pace of her job, recruiting students and weeding through applicants. It’s not surprising that her personal life has taken a backseat to her career. Portia is met with many personal challenges, a broken heart, and the pains in her past. She must be able to balance her job and address these issues simultaneously, without losing sight of her goals. Admission is an intelligent read. Portia is a strong main character, and it was refreshing to read a novel with captivating dialogue, a passionate heroine, and good content. The plot is slow to start and I wanted more of a conclusive ending, but overall I was intrigued by this book. Admission, due to its focus on Portia’s career as an Admissions counselor for Princeton University, is very heavy on the college admission process. The details were enthralling, but it sometimes felt as if I were reading two different books. It was almost like the author dropped a manuscript for a college admission manual and a novel about Portia, gathered up the pages, and sent it off to the publisher. It was sometimes tough to get to the plot, and by the end of the book, I was sure that if I had to read about Portia arguing about the fairness of the application process or another several pages about the do’s and don’ts of college applications, I would put the book down. If you can get past those little flaws, Admission is a great read. Check out the Reading Group Guide. .-= TARA´s last blog ..Mommy & Me Monday! =-. I have your button on my site! I have your event button on my site! I’m excited to read this book. It’s nice that Portia is finally letting herself come out of her shell. I follow you on your blog by email. I’ve been seeing this book, and I would love to read it. Thanks! I’d like to win this for laura my friend. I’d love it! Thanks for the giveaway. i would love to read admission, sounds great!